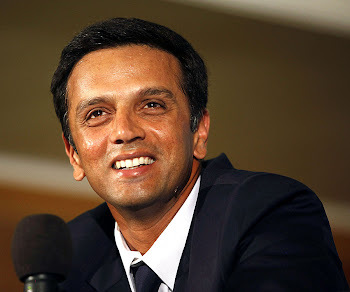 Dravid had a disappointing start to his career making his debut in one-dayers against Sri Lankan cricket team in the Singer Cup in Singapore immediately after World Cup in March 1996, replacing Vinod Kambli. Subsequently he was dropped from the team until he was picked again for the tour of England when Sanjay Manjrekar was injured.With Manjrekar sidelined, he then made his debut in the Second Test against England along with Sourav Ganguly, scoring 95 . He held his position on Manjrekar's return for the Third Test, scoring 84 . After moderate home series against Australia and South Africa, Dravid broke through on the 1996-97 tour of South Africa. He batted at No. 3 in the third Test in Johannesburg, scoring his maiden century with 148 and 81, the top score in each innings to claim his first man of the match award . He also finally made his first half-century against Pakistan in the Sahara Cup in 1996, scoring 90 in his 10th ODI.In the 18 months ending in mid-1998, he played in an away series against the West Indies, home and away series against Sri Lanka and a home series against Australia, he scored consistently, with 964 runs at an average of 56.7. He scored eleven half-centuries but was unable to convert them to triple figures. He scored his second century in late 1998 against Zimbabwe in a one-off Test match, top-scoring in both innings with 148 and 44, but was unable to prevent an Indian defeat. He then became the third Indian batsman after Vijay Hazare and Sunil Gavaskar to score centuries in both innings of a match during the 1999 New Year's Test match against New Zealand with 190 and 103* to force a draw, batting for a total of 653 minutes. He had a moderate subcontinental season in early 1999, scoring 269 runs at 38.42 with one century before scoring 239 at 39.8 including a century against New Zealand in late 1999. This was followed by a poor away series against Australia and another poor home series against South Africa, accumulating just 187 runs at an average of 18.7. He then scored 200*, his first double century, against Zimbabwe in Delhi which along with 70* in the second innings helped India to victory. It was the first time he had passed 50 in 12 months and he followed this with a 162 in the following Test, giving him 432 runs in the two match series at an average of 432.